As the Federal government remains shut down for the longest continuous period in US history, Republicans and Democrats have broadened their strategic approaches to budget negotiations. Senate Republicans have fought to prevent Democrats from narrowing the scope of the conflict to just Department of Homeland Security by repeatedly blocking legislation that would reopen everything but DHS. At the same time, in a relatively uncommon move, Senate Minority Leader Chuck Schumer has directly reached out to the base to pledge opposition to the wall, having recently appeared on Pod Save America to that effect. Speaker of the House Nancy Pelosi has commanded from the front, sending legislation to the Senate while reporting on Trump’s erratic and unreliable behavior to a press increasingly unable to access an isolated, angry president. Trump, who in his own words caused the shutdown to no fault of the Democrats, now argues that it was the Democrats’ fault for causing the shutdown (voters agree with the former Trump, not the latter). The basis of the disagreement seems to be intractable: Trump said he would cause the shutdown over a proposed border wall that Speaker Pelosi and the Democrats have no desire to fund (although we found strengthening the border to be perhaps the GOP’s only narrowly-popular current policy position, though we were careful not to explicitly mention a wall). Many factors explain how we got here, but whatever other factors will eventually be blamed for America’s longest government shutdown, Trump’s decision to stake it on “the wall” represents perhaps the current deepest policy divide in the United States (not political divide -- party ID will always hold that record, at least in the modern era). Think of it like this. Let’s say you only knew a voter’s policy positions, and not any demographic characteristics that are usually correlated with who they vote for, like age, education, born-again status, etc. If you wanted to guess who someone voted for in 2018, which policy position would you want to know most if you could only have one? While the Green New Deal is currently at the top of many Democrats’ lists, it is also wildly popular across the political spectrum, and so it wouldn’t help you make a guess. By contrast, policies that are already highly politicized like Medicare for All would help you make such a guess. And pretty much no matter how you slice it, the border sits at the top of the list of policies that help tell Democrats from Republicans. If you know someone’s position on “the wall,” you would have much more information on which to base your guess than if you only knew how they felt about very left but very popular ideas like public Internet or corporate pollution fees. In the following chart I show the standardized regression coefficients for a model in which the dependent variable is Republican vote choice, and the independent variables are a variety of policy items asked on Data for Progress’ pre-election What The Hell Happened survey. 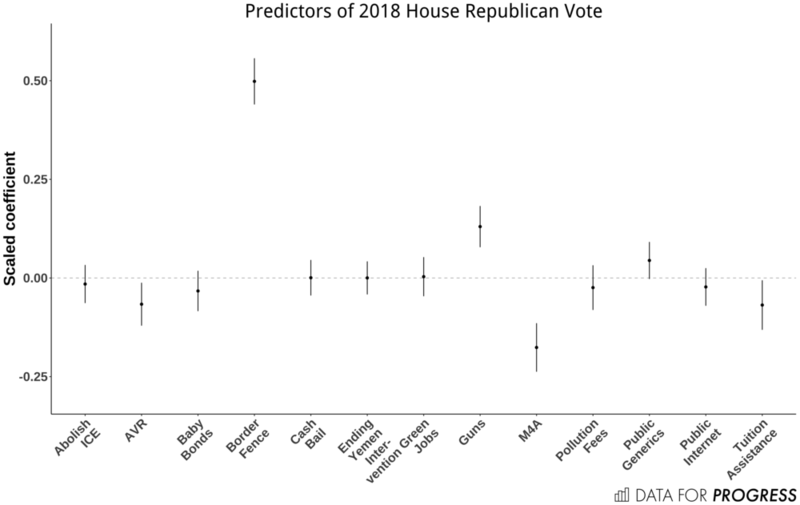 The farther the coefficients are from zero, the better predictors they are of Republican vote choice in 2018. The coefficient on “Border Fence” being high above zero tells us that a given voter’s position on the border is a strong predictor of Republican vote choice in 2018, and the coefficient on Medicare for All being below zero tells us that a given voter’s position on Medicare for All is a pretty good predictor of Democratic vote choice. To put it another way, let’s say we were to build such a model only after knowing how “important” each of our variables were to the model’s analytic purposes, here, to predict 2018 vote choice. Using conventional means, we can choose to “penalize” some of the variables in our model by how good of a predictor they are, or of how “important” to the model they are. Many ways of doing this involve down-weighting the less important variables, and upweighting the more important. Here, we’ll accomplish by decomposing the coefficients into their un-penalized, standardized, absolute value plus that absolute value times an arbitrary number, λ. Thus, if λ were zero, the coefficient would be identical to their original value, and if λ were very, very high, the “true” component would be reweighted downward until the coefficient goes down to zero. The intuition is that the stronger the correlation to begin with, the more resilient that coefficient is to penalization and the more values of λ it will survive before reducing to zero. I plot the coefficients with a variety of penalty values below. The idea is that variables whose coefficients are non-zero for a larger share of the range of the x-axis have higher “importance” to the original model (which itself is, again, contrived). Clearly, the coefficient on the border item is the most resilient. In contrast, items like the green jobs program and public generic pharmaceuticals quickly go to zero. Again, this is not because they’re unimportant except in teh sense of discriminating between Democrats and Republicans. Voters across the spectrum either support or oppose many policies at about the same rate, whereas voters are also clearly split on the border, and on items like Medicare for All and pro-gun attitudes. One can probably already see that each plot provides substantively similar interpretations: each is meant to show which coefficients are larger than the others. For example, if we subset the analysis to only voters under the age of forty-five, we can see that the magnitude of the coefficient on pro-gun attitudes gains slightly on Medicare for All. And, at the same time, we can see that the range of “importance” for gun attitudes gains on Medicare for All. For voters under the age of forty-five, pro-gun attitudes are slightly better discriminator of vote choice than among the full sample. In understanding why the shutdown is playing out as it is, it is crucial to know that just because Trump owns the wall (and the shutdown) does not mean that Democrats’ attitudes on the wall are unimportant. On the contrary, they appear to be a strong motivator of the party leadership’s strategy. More so than any of the major policies that will be on the table in the coming few cycles, the wall serves as the highest lightning rod, and is the issue Trump has forced each side to fight over as his shutdown continues.